January 30, 2007 - FAA Administrator Marion Blakey, in a luncheon speech at the National Press Club, proposed a rule change that would allow pilots to fly until they were 65 years of age. 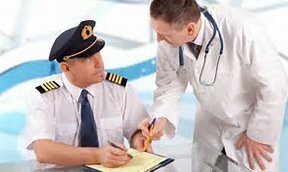 Under the proposal, if one pilot on a flight were older than 60, the other pilot in the cockpit would have to be younger than 60. The House of Representatives approved the bill provided they took medical tests twice a year. It also mandated that airlines must perform additional proficiency checks on pilots over 60. March 23, 2007 - FAA dedicated it's newest air traffic control facility in Guam. With oversight responsibility for nearly 200,000 square miles of airspace in the South Pacific, the new Guam Center will consolidate a number of air traffic functions in a single location. It would house en route and terminal radar air traffic control, a new air traffic control tower for the local international airport, and a technical operations division. 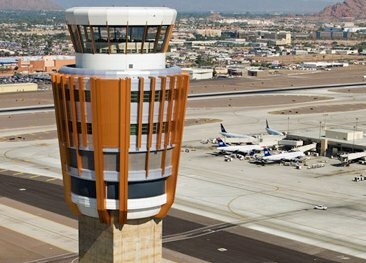 April 11, 2007 - FAA dedicated the new $90 million, 324-feet tall air traffic control tower at Phoenix's Sky Harbor International Airport. The new tower features state-of-the-art equipment and design. At 850 square feet, it is twice as tall as the old Phoenix Tower, built in 1977, and could accommodate 11 controllers in a cab 3 times the size of the previous one. The new TRACON section of the structure, with work stations for 22 controllers, replaced a 50-year old leased building that only accommodated 13 controllers. 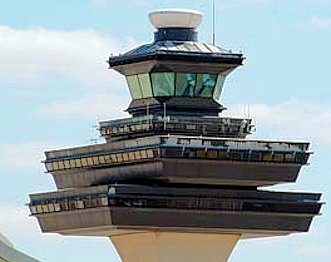 September 18, 2007 - FAA dedicated the new air traffic control tower at Washington Dulles International Airport (IAD). Dulles is one of 3 major airports in the Baltimore-Washington metropolitan area with more than 21 million passengers a year. 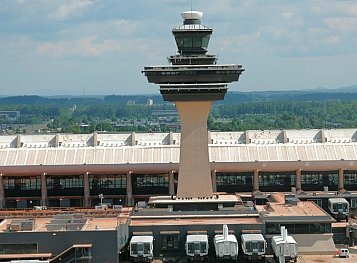 Dulles has the most international passenger traffic in the Mid-Atlantic outside of the New York metropolitan area. The Smithsonian National Air and space Museum opened the Steven F. Udvar-Hazy Center at Dulles. The museum annex houses an Air France Concorde, the Enola Gay B-29, the Space Shuttle 'Discovery', the Boeing 367-80, which was the prototype of the Boeing B-707, and other famous aerospace artifacts too large for the main Air and Space Museum on the National Mall. Dulles airport received its first Airbus A-380 flight when Air France introduced the A-380 nonstop service from Paris Charles de Gaulle Airport to Dulles. March 10, 2008 - DOT Secretary Mary Peters announced that the Department would move key elements of NextGen - the new satellite-based aviation system designed to enhance efficiency and minimize delays across the nation. Florida would serve as the test-bed for the new system with the introduction of NextGen at Daytona Beach. 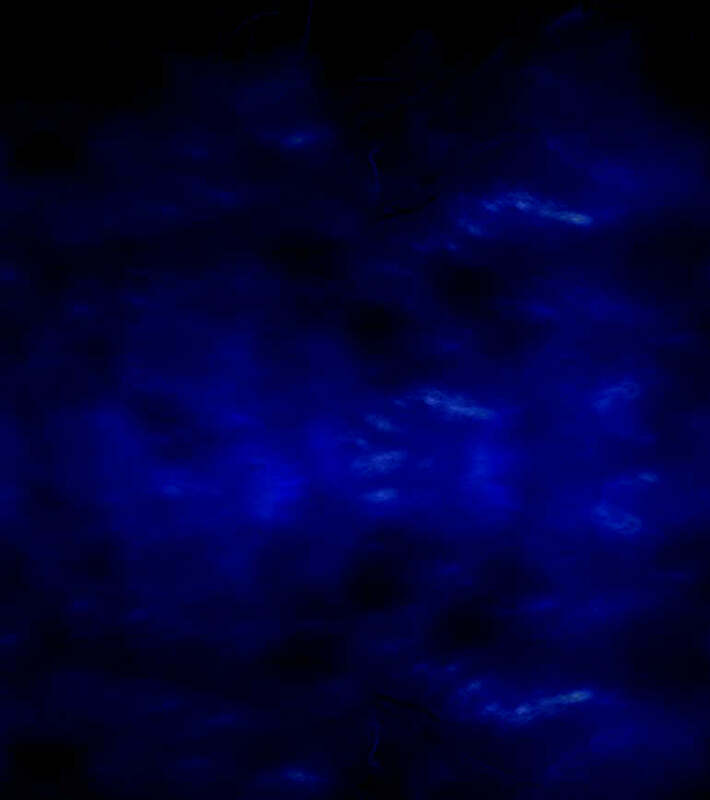 A new descent technique would also help to save fuel, and reduce noise and emissions in Miami. In addition, Automatic Dependent Surveillance Broadcast technology would help increase the capacity of airspace along Florida's Gulf Coast by allowing planes to fly more closely together without compromising safety. 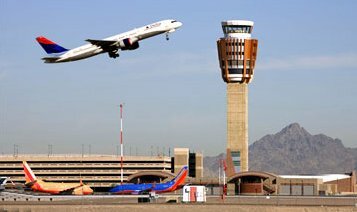 Automatic Dependent Surveillance Broadcast (ADS-B) will replace radars as the primary means by which air traffic controllers track and manage aircraft. ADS-B is a foundational technology that modernizes the national airspace from a ground radar system to satellite-based GPS technology. This satellite-based technology enables more efficient separation and provides coverage where radar doesn't exist, like over the Gulf of Mexico and in mountainous terrain. FAA and aviation industry leaders have committed to equip aircraft with the new NextGen avionics technology by January 1, 2020. April 16, 2008 - The Department of Transportation finalized changes to its 'bumping rule', which doubled the limit on compensation airlines had to pay passengers involuntarily bumped from their flight. Under the new rule, fliers who were involuntarily bumped would receive up to $400 if rescheduled to reach their destination within 2 hours, or 4 hours for international flights, and up to $800 if they were not rerouted within that timeframe. The new rule covered flights operated with aircraft seating 30 or more people. 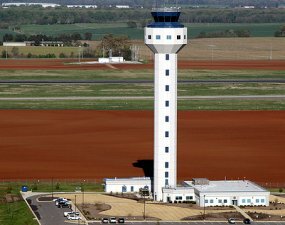 June 3, 2008 - FAA dedicated a new 228-foot-tall airport traffic control tower at Huntsville International Airport, Alabama. 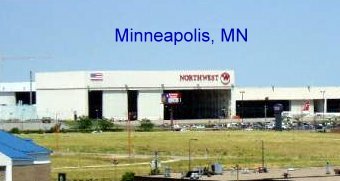 The $18.5 million tower complex is located one mile south of the previous facility in a gated, fenced complex between the parallel runways. Along with the tower is a 10,500-square foot base building and included generator building and parking. The new 800 square foot TRACON more than doubled the size of the old TRACON. Huntsville International Airport is located 10 miles southwest of downtown Huntsville, in Madison County, Alabama. With over 80,000 aircraft operations (average 221 per day), 34% were military flights. July 18, 2008 - The Engineered Materials Arresting System (EMAS) successfully stopped a Mexican Airlines Airbus A-320 that overran Runway 22L at Chicago's O'Hare Airport. Mexicana Flight MXA802 from Mexico City, had 138 passengers and 7 crew members on board. No fatalities. The A-320 landed in rainy weather, with strong and gusty crosswinds. This incident illustrates the value of arrestor beds at the end of runways. The arrestor beds or Engineered Material Arresting System (EMAS), are areas of crushable material (usually a mixture of water, foam and concrete) beyond the threshold of a runway. The material is designed to crush under the weight of an aircraft absorbing energy and gradually reducing the airplane's forward momentum until it stops, similar to mountainous runaway truck ramps. October 30, 2008 - The U.S. Department of Justice approved the merger between Delta Air Lines and Northwest Airlines. 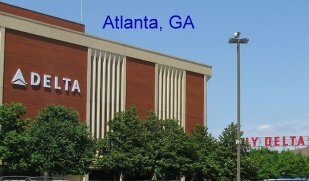 Delta Air Lines headquarters is at Hartsfield-Jackson Atlanta International Airport in Atlanta, Georgia. November 11, 2008 - The new Indianapolis International Airport opened. Construction funds came from federal grants, airport revenue bonds, and passenger head taxes. More than 1,100 residences were bought for the $220 million project. 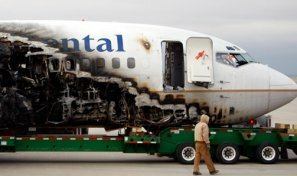 December 20, 2008 - Continental Airlines Flight 1404, a Boeing B-737, from Denver to George Bush Intercontinental Airport in Houston, Texas, with 115 people on board, veers off the runway upon takeoff from Denver International Airport, comes to rest in a ravine near the runway and catches fire. No loss of life, but 2 critical injuries, and 36 non-critical injuries, and a hull loss of the B-737. Just before takeoff, at about 90 knots, the crew heard a bumping or rattling sound and they aborted the takeoff. The first officer told investigators that the B-737 moved away from the runway centerline and made a sudden left turn. Initial speculation is that the jet could have had a landing gear malfunction that might have resulted in a wheel lockup during the takeoff roll. The NTSB published that the probable cause of this accident was the captain's cessation of right rudder input, which was needed to maintain directional control of the jet, about 4 seconds before the airplane encountered a strong gusty crosswind that exceeded the captain's training and experience. The B-737 sustained severe damage. The fuselage was cracked just behind the wings; the Number 1 engine and main landing gear were sheared off; and the nose gear collapsed.